Hilgard Peak is the tallest mountain in western Montana’s Madison Range. At 11,316’ in elevation, Hilgard is also that highest peak in Montana outside of the Beartooth’s. Hilgard is a rugged and remote peak. The summit can be reached in a long day hike, or as an excellent overnight backpack. This is a well-earned summit, with the crux being a challenging scramble up the craggy summit block. Hilgard was the first objective in our “Michael’s Awesome Peaks” road trip. After a driving from Boise Saturday morning, Michael, John, and I hit the trail toward Avalanche Lake just after 2pm. Not too warm, not too smoky, and armed with bear spray, we were feeling good. We made good time heading up the trail, with just a few short pauses for washed out creek crossings and huckleberries. We covered the 6 miles to Avalanche Lake in just under 3 hours. There had been some discussion about camping up and over the ridge closer to Hilgard, but wisely decided to camp at the smaller lake up and to the west of Avalanche. After a nice meal, we headed for the tents early for the night to escape the constant buzz of bloodsucking mosquitos. The next morning we were on our feet just after 6am heading toward the saddle to cross over to Hilgard. Unfortunately, we climbed to the wrong saddle, south of the standard route. But the climb up may actually have been easier, and we got to enjoy a nice ridge walk over to the correct notch/saddle. From the notch, we had a view of the daunting down climb and boulder fields that separated us from Hilgard. But we did what had to be done, and were at the base of the peak about 90 minutes later. From here, there was no obvious route up the peak. We tried the southeast face, then ultimately traversed around to the east side and the gully route. We climbed the right side of the gully until an exposed class 4 move to cross over, then further up the now gentler gully. There was some ongoing scrambling with occasional exposure. It was challenging, fun, and somewhat of a relief when the ridge came into view and we made the final scramble up and to the summit. After the challenging climb, it felt good to exchange high fives on the summit. The skies were ominous, with some smoke, some clouds, and a light snow flurry in progress. But our work wasn’t done, and we carefully down climbed back down the east ridge. From there we made the long boulder field crossing and tedious loose climb back up to the notch. We enjoyed a nice lunch in the upper basin, then dropped back down to the campsite. 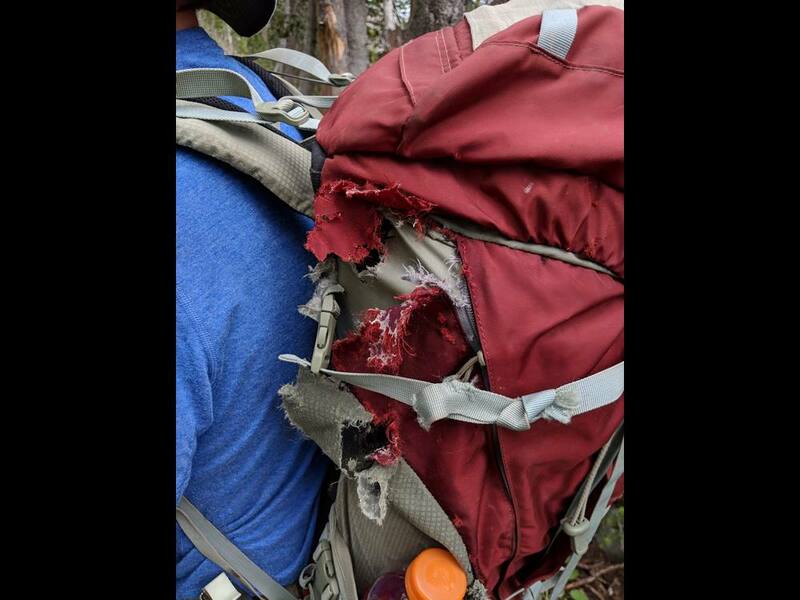 All was well, except we caught a squirrel in the act of destroying my backpack that I’d hung in a tree before our climb. Stinking little varmint! The 6+ mile hike back down the trail seem to take forever, so it felt good to finally get back in the truck and head toward Bozeman for the night. Stats on Hilgard were about 18 miles and 5800’ elevation gain round trip. What a great trip in the Madison Range. Next up, Hollowtop Mountain. 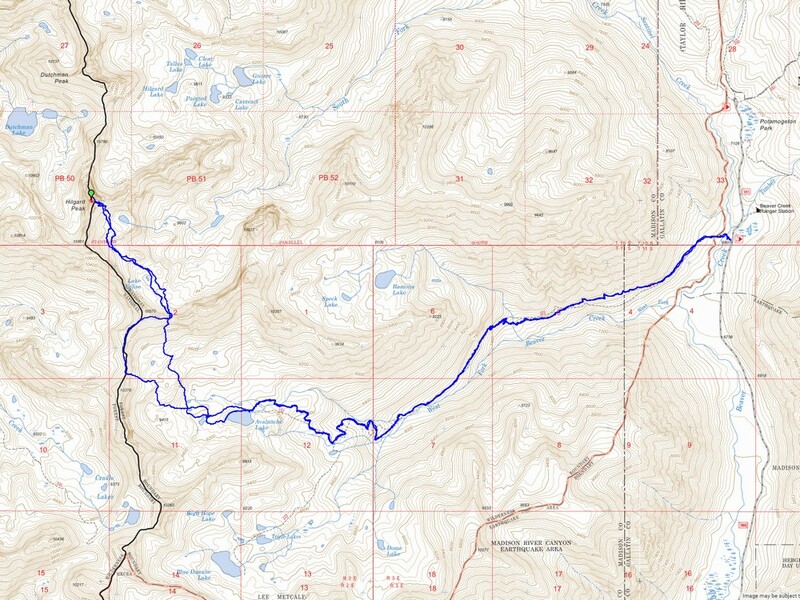 Map of the route, 18 miles and 5800' gain round trip. West Fork Beaver Creek Trailhead. Our camp at the upper lake. Hiking up toward the wrong, but possibly easier saddle. Walking the ridge over to the correct saddle. First good view of Hilgard, from the notch. Lots of debris to cross. John is down in those boulder somewhere. Nearing the base of Hilgard Peak. The crux move on the east face gully. Lots of fun scrambling up to the ridge. Below the summit block of Hilgard Peak. Hilgard Peak summit shot, snowing lightly. Hilgard basin to the north. Bluebird near Lake Eglise on the way back. Painful climbing back up to the notch. Looking back on the correct notch after the climb. Map of the route, 18 miles and 5200' gain round trip.West Fork Beaver Creek Trailhead.Avalanche LakeOur camp at the upper lake.View from our campsite.Hiking up toward the wrong, but possibly easier saddle.Beautiful area.Walking the ridge over to the correct saddle.First good view of Hilgard, from the notch. Lots of debris to cross.John is down in those boulder somewhere.Nearing the base of Hilgard Peak.The crux move on the east face gully.Lots of fun scrambling up to the ridge.Below the summit block of Hilgard Peak.Hilgard Peak summit shot, snowing lightly.Hilgard basin to the north.Bluebird near Lake Eglise on the way back.Painful climbing back up to the notch.Looking back on the correct notch after the climb.Squirrel destroyed my pack!